Submitter: A coworker of mine found this one. 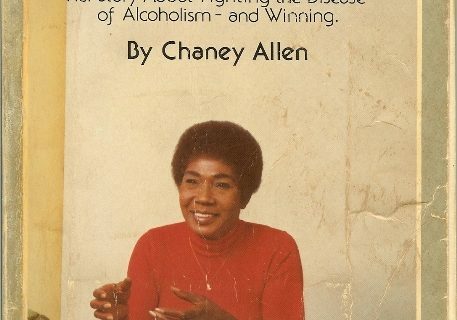 What’s really weird is that the book was published in 1981. Wasn’t desegregation from much earlier? Holly: To be fair, most of the libraries showing holdings in WorldCat are universities. This does have research value. It’s the few public libraries on the list that worry me. Hopefully they are in some sort of special collection, not just mixed in with the other 370’s. It does seem like a fairly modern date for this topic, but actually modern education gurus like Jonathan Kozol are publishing currently about what they call “apartheid schools” in the U.S. 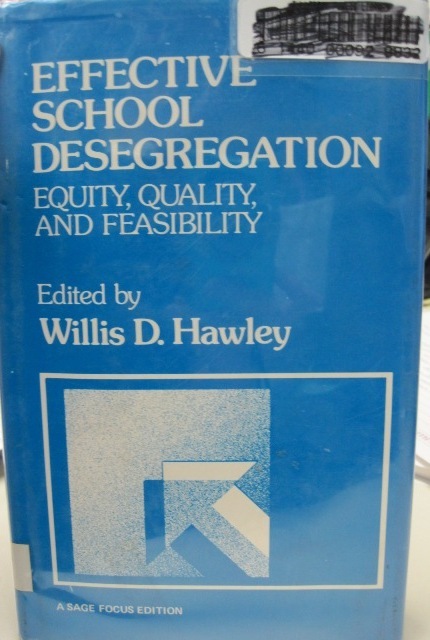 The problem with this title is that it was published too late to be useful to the 1950’s and 1960’s civil rights movement and too old to be useful to the current educational advocacy movement. It was only useful to the 1980’s movement. I’d still weed it if it were in my public library, but it has a place in certain research libraries. Next Post:Will Disco Ever Die? Seems like it’s less “desegregation” in the “striking down laws about what races can do what” sense and more in the “actually getting white parents to send their kids to school with non-white people and vice versa” sense. 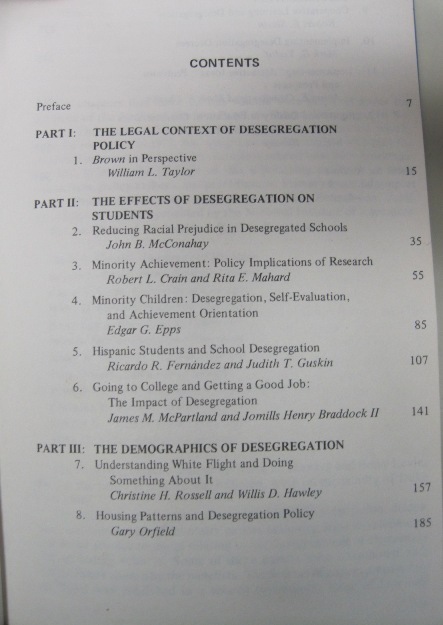 Oh, hey, there’s a chapter on Hispanic desegregation as well. We often tend to think of desegregation in terms of the mid-20th-century African American-led civil rights movement, and there are still lots of schools where black children are the majority minority, but nowadays most schools in the southwest U.S. are facing an influx of Latino families and I imagine that those schools’ “desegregation” needs are quite different from schools in the southeast. But yeah… this book is really too outdated to be of much use beyond historical research. This is a really interesting subject– it’s too bad that a lot of folks are under the impression that segregation in U.S. schools is a thing of the past, when in reality it’s something many folks still struggle against. they were bussing here in Dallas in the early 80’s. my husband was bussed to a school in a different district and has never considered bussing a good thing. i think he would actually find this book interesting. Many districts in the South, including the one where I live, are still under federal desegregration orders, which basically means the federal government keeps a close eye on them to make sure they are providing equal opportunities and facilities for all students. Certainly this particular book is outdated, but the concept is not. Busing in Boston was an issue from the mid 1970s through the 80’s. 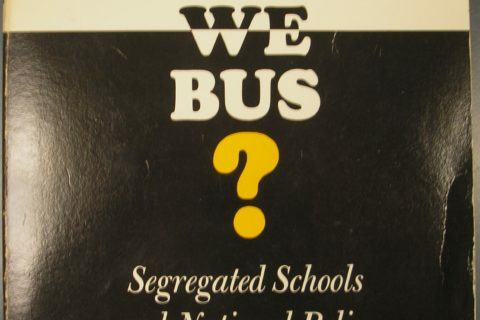 Perhaps this book was an attempt to say how desegregation could occur peacefully (unlike Boston). I live in the rural South and our county wasn’t fully desegregated until 1991. It did not mean that blacks and whites went to school separately from each other—we were all together. It meant that there were not equitable schools per population and location. New schools had to be established or old schools were re-zoned. Yes, it was really called desegregation in this sense. or the Harvard Civil Rights Project. I read that Kozol book! For a class on diversity on education!